Plot Unknown - Sequel to the 1993 Anime film, Ninja Scroll. Bandit Boss: Thanks to your interference, Jubei, we lost 300 pieces of gold! I can't go back empty-handed! Q: Are the movies "Ninja Resurrection" and "Ninja Resurrection 2: Hell's Spawn" sequels to "Ninja Scroll?" Q: Is there a sequel to "Ninja Scroll?" Q: What are the differences between the old British BBFC 18 DVD and the Uncut Version? 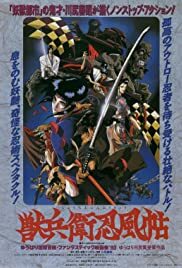 Ninja Scroll is an Anime Classic which is usually mentioned in the same sentence as Vampire Hunter D or Fist of the North Star. However, I believe that as a movie, Ninja Scroll has a wider appeal. The visuals are top-notch, and the action is fast and clean. The sword fights can be watched frame-by-frame (and may have to be, if you want to really understand what is happening) and your awe at the quality of this movie will just increase. Do I sound like an obsessed fan? Because this movie impresses me so greatly that I cannot over-rate it. The story and characters, though, are the main focus of this presentation, which each battle, duel, and other confrontation serving to move the story forward, develop, reveal, or eliminate the characters - all of whom are revealed in a way that is engrossing. Some maybe turned off by the gore, violence, and low value placed on human life; but that is what this time period was about. This is definately for mature audiences. If you do not yet own a copy of this, watch it as if you had never heard of it and enjoy the story developing. Then be plesantly surprised by the superficial stuff - action, animation, sound, and depth of characters.